Samoas, Thin Mints, Tagalongs — everyone has a favorite Girl Scout cookie. Get your favorite from door-to-door sales beginning on Sun., Jan. 28, with booth storefronts starting on Thurs., Feb. 9, and lasting until Mar. 11. 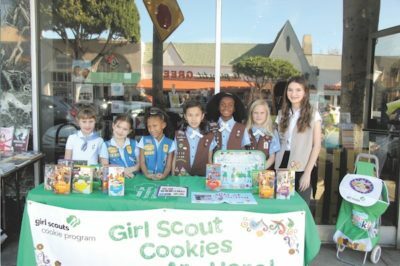 Girl Scout troops, including St. James’-based Troops 1125 and 2115, will begin selling cookies around the neighborhood in front of US Bank, Chevalier’s Books, and Rite Aid on Larchmont Blvd. Other booth locations are at Ralph’s and Trader Joe’s at Third and La Brea and the Ralph’s on Wilshire and Hauser, according to Celia Lopez, the Girl Scout Cookie program chair for Girl Scouts in the Hancock Park / Larchmont / Beverly Hills / Hollywood area. Cookie flavors are the same as last year, featuring the tempting Thin Mints, Samoas, Tagalongs, Trefoils, Do-si-Dos, and Savannah Smiles, as well as the limited gluten-free Toffee-tastic and non-GMO Girl Scout S’mores. Girl Scout Cookies are $5 per box, except for the Toffee-tastic and non-GMO Girl Scout S’mores, which are each $6 per box. Customers also have the option to donate money toward the Gift of Caring program instead of buying cookies, which donations will send cookies to overseas soldiers and local nonprofit organizations. All of the cookie sale profits will stay with originating councils and troops. Troops receive about 10-20% of the sales proceeds, which help to sponsor fun and meaningful experiences chosen by the Girl Scouts. Troop 2115 did not spend last year’s profits and chose to combine some of their savings with this year’s profits. Rebecca Lopez, one of the troop’s third-grade Brownies, who attends St. James’, wants to give the money that they earn to those less fortunate. Delali Suggs-Akaffu, also a Brownie in Troop 2115, echoed the same charitable hopes for the troop’s profit expenditures. “I would probably want to give some for an orphanage, to help them,” Suggs-Akaffu said. “I was going to say go to Hawaii, but that might be too expensive,” she added. Troop 1125, a first-grade Daisies troop, is discussing a different plan for its profits this year: day camp. Troop members Charlotte Stern and Harmony Welton, who are working on achieving their gardening badges, want to spend their cookie profits at the day camp Tumbleweed. “It has the kinds of things that are really fun for kids,” Stern and Welton said together. But for Sarah Curtis of Cadette Troop 16525, just selling cookies came with its own profitable experience. Curtis was one of the six local Girl Scouts to sell over 2,000 boxes of cookies last year, which earned her a limo ride and lunch with the Girl Scouts’ CEO. “It was really fun!” Curtis said. In addition to earning experience through sales, selling cookies creates a unique way for Girl Scouts to become more involved in the neighborhood. For more cookie information, and maybe even to send a troop to Hawaii, be sure to check out girlscouts.org/en/cookies/all-about-cookies.html. By Talia Abrahamson, Plymouth Blvd., and a sophomore at Marlborough School.